I am “soon to retire” Army Colonel Alpo Portelli. This past summer, my wife Gail and I returned to the States after 16 consecutive years of military assignments throughout Europe. Raised in an avid boating family in Norway, my dream was to retire to a large yacht and circumnavigate the world. Married to a wonderful woman who can get seasick in a bathtub but who still enjoys to travel the globe, we decided a transition from sea to land yacht would be the best strategic course of action! We both camped during our childhoods. While enjoyable, our family camping adventures were of the austere variety—tents and Volkswagen pop-up vans. We decided that to truly enjoy RVing, we should do so with all the conveniences of home. 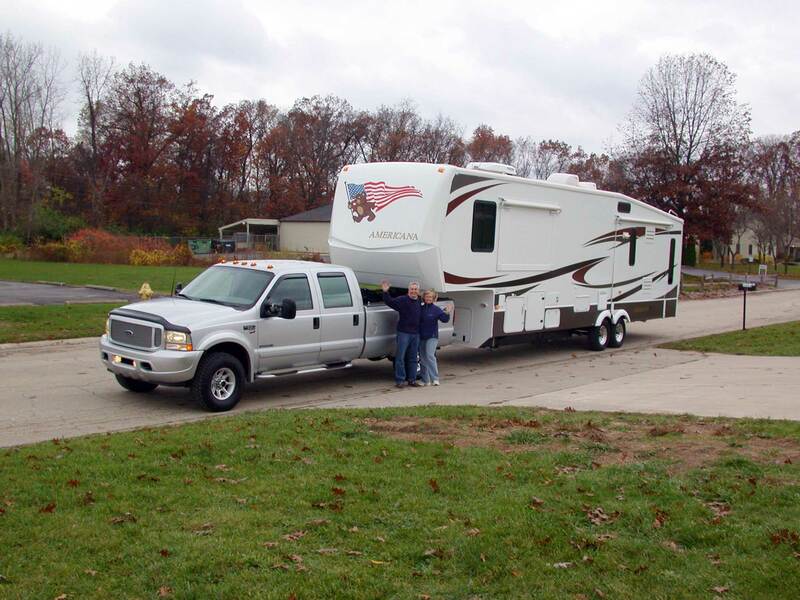 We discovered Americana RV by accident when we began researching RVs on-line some six years ago. A 2003 e-mail query from Norway to Russ Anderson began what has become an exciting experience and growing friendships with a fabulous group of Americana RV employees and Americana RV owners. Between 2003 and 2009, Russ, along with Jerry LeMar, answered all of our questions, not only about Americana RVs, but also about RV lifestyle in general. During that period, Gail and I read and re-read tons of RV literature and brochures in search of our dream RV. Time and time again, we kept returning to the Americana RV website and the great info packets that Russ sent to us. Ultimately, in the summer of 2009, as we were returning home to our retirement assignment at the Army War College in Carlisle PA, Russ and Jerry let us know that they were going to sell, as a package deal, their coveted 2002 F-350 and new RT 38/39 demo model that is so prominently displayed and discussed on their website. Gail saw my eyes glaze over and, knowing this was too good a deal to pass up, told me to call Russ and tell him to take the package off the market as it was now ours! In mid-August 2009, we travelled to the factory up-fitting center in Elkhart, Indiana, finally met Russ and Jerry face to face (after all these years), participated in an RV factory check-out/delivery with buyers and prospective buyers and purchased our rig. Our rig was actually at the Bullhead City, Arizona lot, where it had been driven previously by Russ and Jerry, not only for display, but also to support the excellent mileage and performance tests seen on the Americana RV website. Russ and Jerry drove the rig back to Elkhart for us and, during the week of 26 October 2009, we conducted our own check-out/delivery. Russ, Jerry and Ron Green and crew at the Elkhart factory welcomed us fully into the Americana RV family. We both received personal driver and systems training from Russ, Jerry and Ron – an unheard of “hands-on” service during normal dealership purchases - and the crew walked us personally through all aspects of the truck (“Jerry’s Baby”) and the RV. Neither Russ nor Jerry would let us depart Elkhart before we were proficient at driving, cornering and backing up such a large rig and Ron & crew wouldn’t think to let us depart unless all systems checked out A-OK (to include Gail’s brand new washer/dryer combo – “all the comforts of home” remember). For Gail and me, both new to the lifestyle and new to driving “the Behemoth,” this personal style of care and instruction added to our confidence as we embark on a new lifestyle. Our return drive to Carlisle was fairly effortless. The truck and rig handled beautifully. The rig averaged over 9 mpg on the tow back and will surely improve a bit as I learn to handle her better. I’ll admit I made a couple of calls during the drive to Jerry for advice along the way, particularly when I got the truck stuck in the mud after we dry camped for the night in Gail’s brother’s yard in Pittsburgh on the way home. A little good advice from Jerry got us un-stuck and on the road again, taught me some immediate lessons about towing a heavy rig with a heavy truck, and re-affirmed Russ, Jerry and Ron’s promise that they would always be available for help or assistance. Winter is now setting in here in Pennsylvania. “Jerry’s Baby” sits gleaming in our driveway and is coddled affectionately. The RV, now winterized with advice from Ron, is sitting at her site in the local RV campground, the solar panel and inverter are keeping the batteries fully charged and she is semi-hibernating for the winter. In the spring, we’ll wake her up and spend weekends aboard and, as the result of a raffle entry at the Hershey RV Show; we’ll be able to spend 15 days free camping at the renowned private Gettysburg RV Park. Our Americana RV experience has been superb. The entire process has been hassle and worry free and we recommend it highly to current and future RV owners. For those of you contemplating a factory-direct RV purchase, you can’t go wrong with Americana RV. Soon we’ll be able to hit the road fulltime. We will circumnavigate the country as we re-connect with America after being away for so many years. Along the way, I know we’ll return to visit the gang in Elkhart and yes, we will visit Bullhead City….not only to prove to Jerry that we are taking care of “His Baby,” but also to meet other members of the growing Americana family.